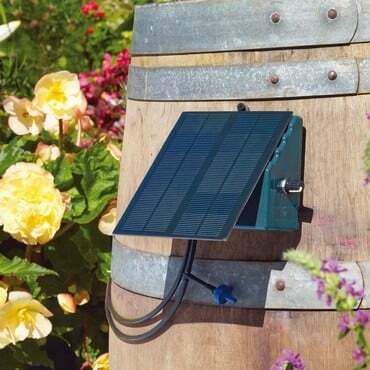 Standing with your finger over the end of a garden hose and spraying your vegetable plants and ornamental borders could be a real blast from the past, thanks to the adaptability and super-efficiency of this Garden Watering Kit. 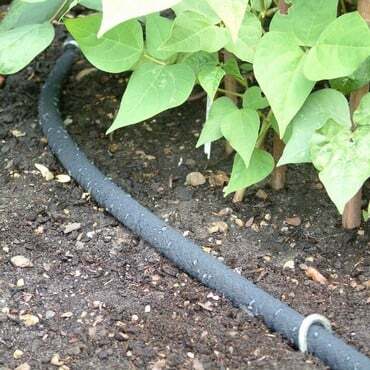 Ideal for watering pots and planters, garden borders and vegetable patches, the combined 35 metres of piping (10m of main distribution pipe and 25m of sprinkler supply pipe) provides the potential for watering en masse and as each of the 20 sprinklers can irrigate an area up to 2 metres in diameter (depending on water pressure), your plants certainly won't go thirsty! The sprinklers - all of which are fully adjustable - simply push into the end of each piece of supply pipe and as all the piping can be cut to length with a pair of scissors, the whole Garden Watering Kit system can be tailored to your own particular garden situation. I recently bought this and a timer - the items arrived promptly and well packaged. We have returned from our holiday, and the system seems to have worked perfectly. This product represents excellent value for money as a starter system. 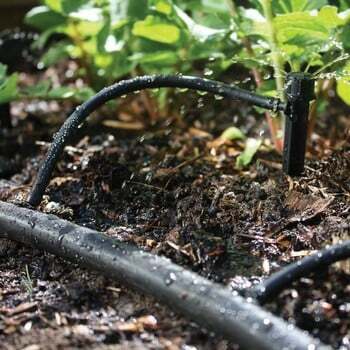 The generous number of watering outlets means that the main hose can be extended quite well. 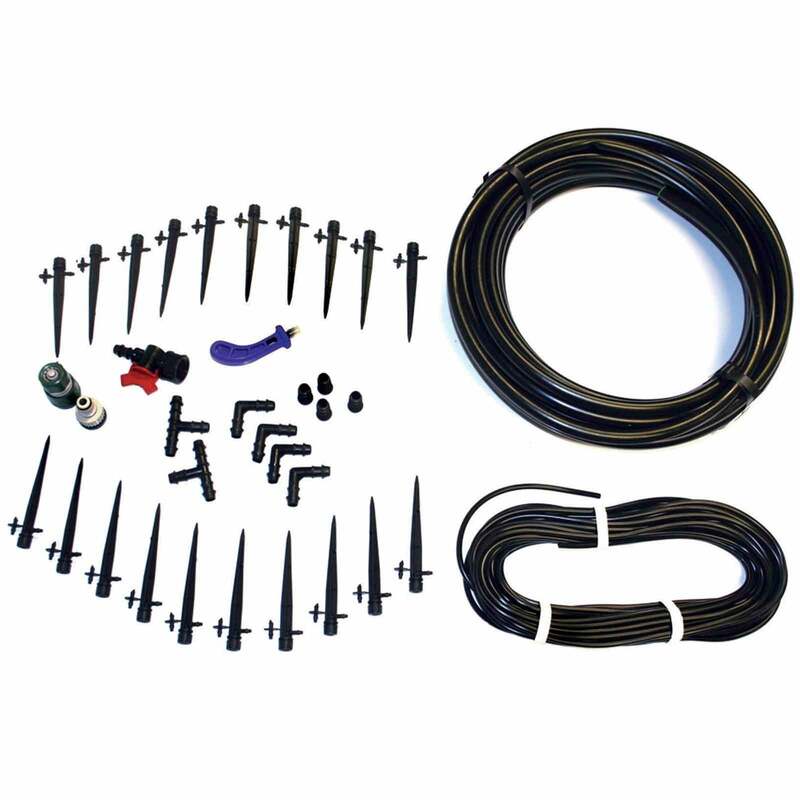 Suited for use with a mains water supply, this Garden Watering Kit comes with all necessary connectors, fittings, including 10m (32ft) of water distribution pipe and 20 fully adjustable sprinklers. 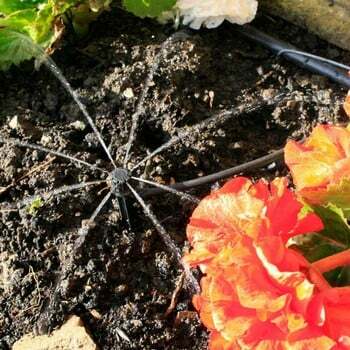 KG Verdict - Quality ***** Ease of Use ***** Value for Money ***** This is a very versatile and effective kit. Lots of options for how you want to lay it out and the adjustable sprinklers allow for an even and broad spread of water. 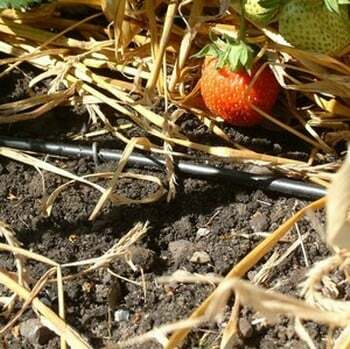 Armed only with a pair of scissors, you can cut the supply pipes of this clever system to size, ensuring that the 20 fully adjustable sprinklers are working exactly where needed to keep your crops happy. 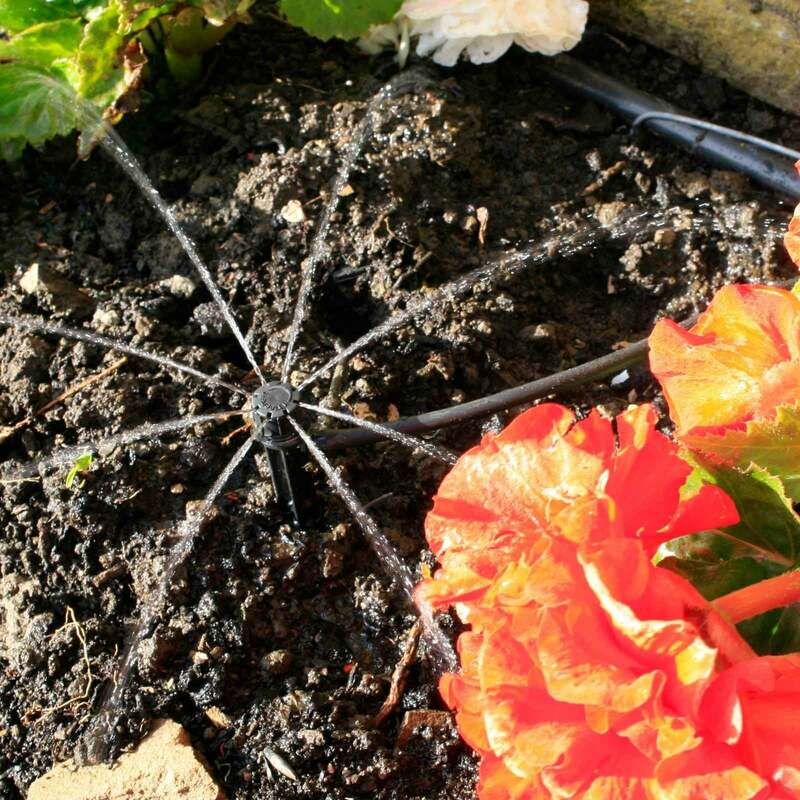 Because you are watering soil, not leaves, you can reduce the rist of downy mildew and other diseases- and the whole kit can be packed away in a garage or shed for winter if required.